Westdyke is a city in the State of Alderney. 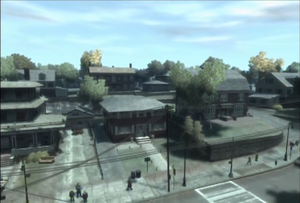 It is located in northern Alderney, bordered by Flathead Rd in the South (Leftwood), and the West River to the east (Northwood in Algonquin, Liberty City). Westdyke is a large and sparse suburban city in Alderney and also Alderney's wealthiest city. North Westdyke is made up of large homes and mansions in a quiet suburbia, home to some of Alderney & Liberty's elite such as Jimmy Pegorino, Don of Alderney's Pegorino Family, the celebutante socialite Cloe Parker and Bryce Dawkins, the Deputy Mayor of Liberty City. South Westdyke is more dense with population and services and close to where it starts to merge with Leftwood. Along the north and east coastlines of Westdyke makes up the Alderney Beach, which is a mix of beaches and cliffs. Westdyke appears to contain elements of Weehawken, New Jersey, as well as other towns from Bergen County and the Jersey Shore in general, which is unusual since their locations don't correctly correspond (but Alderney's districts as a whole poorly represent New Jersey's). The cliffs that separate the abandoned mansion as well as the streets between it and the Hickey Bridge from the West River are likely influenced by the Palisades cliffs. In the side mision 'Stevie's Car Thefts' a gold Turismo can be found parked next to a posh house on Owl Creek Ave, the poshest road in Westdyke. When the player breaks into it, a alarm will sound, and they are usually Cops patrolling the area. So as it is a supercar, try and lose them on the way back to the garage in Bohan. A rare Sultan RS can be found behind the garage of an abandoned mansion just off Beaverhead Ave by following an off-road path near the Burger Shot. There is also a helicopter landing pad in the backyard of one of the mansions, where a Maverick sometimes spawns, on Owl Creek Ave. Some of the houses along Big Horn Drive & Owl Creek Ave, were featured on CNT's hit reality show, I'm Rich. Despite its name, most of Westdyke Memorial Hospital is actually located within the Leftwood borders in West Leftwood. The word “dyke” is a slang term for a lesbian. This page was last modified on 8 May 2012, at 22:37.